Background and objectives Dense deposit disease (DDD), a subtype of C3 glomerulopathy, is a rare disease affecting mostly children. Treatment options are limited. Debate exists whether eculizumab, a monoclonal antibody against complement factor C5, is effective in DDD. Reported data are scarce, especially in children. Design, setting, participants, & measurements The authors analyzed clinical and histologic data of five pediatric patients with a native kidney biopsy diagnosis of DDD. Patients received eculizumab as therapy of last resort for severe nephritic or nephrotic syndrome with alternative pathway complement activation; this therapy was given only when the patients had not or only marginally responded to immunosuppressive therapy. Outcome measures were kidney function, proteinuria, and urine analysis. Results In all, seven disease episodes were treated with eculizumab (six episodes of severe nephritic syndrome [two of which required dialysis] and one nephrotic syndrome episode). Median age at treatment start was 8.4 (range, 5.9–13) years. For three treatment episodes, eculizumab was the sole immunosuppressive treatment. In all patients, both proteinuria and renal function improved significantly within 12 weeks of treatment (median urinary protein-to-creatinine ratio of 8.5 [range, 2.2–17] versus 1.1 [range, 0.2–2.0] g/g, P<0.005, and eGFR of 58 [range, 17–114] versus 77 [range, 50–129] ml/min per 1.73 m2, P<0.01). A striking finding was the disappearance of leukocyturia within 1 week after the first eculizumab dose in all five episodes with leukocyturia at treatment initiation. Conclusions In this case series of pediatric patients with DDD, eculizumab treatment was associated with reduction in proteinuria and increase in eGFR. Leukocyturia resolved within 1 week of initiation of eculizumab treatment. These results underscore the need for a randomized trial of eculizumab in DDD. Dense deposit disease (DDD) is a subtype of C3 glomerulopathy, characterized by the glomerular deposition of complement factor 3 (C3) and caused by dysregulation of the alternative complement pathway (1–3). Progression toward ESRD occurs in >50% of patients within 10 years of diagnosis, with younger patients more prone to development of ESRD than older patients (4). Finally, recurrence of DDD after kidney transplantation is common (5,6). Treatment strategies for DDD have included corticosteroids, cyclophosphamide, calcineurin inhibitors, plasma exchange, mycophenolate mofetil (MMF), and rituximab (7). However, to date, no evidence exists that any of these treatments indeed influences the course of the disease (3,7,8) and, consequently, the prognosis remains dismal (9,10). In recent years, attention has shifted to eculizumab, a humanized monoclonal antibody that binds complement factor 5 (C5) with high affinity and thus prevents generation of the terminal complement complex C5bC9. Formation of C5a, a powerful anaphylatoxin and chemotactin, is also prevented. Eculizumab is registered for use in paroxysmal nocturnal hematuria (11) and atypical hemolytic uremic syndrome (HUS) (12). Recent reports have described the use of eculizumab in DDD, with varying results (13–21). In view of the above, we decided to administer eculizumab to patients with DDD who have severe nephritic syndrome or nephrotic syndrome and in whom immunosuppressive therapy had failed. Here we report a retrospective analysis of the response to eculizumab during seven disease episodes in a total of five pediatric patients with DDD. Eculizumab was prescribed to patients who had (1) a native kidney biopsy diagnosis of C3 glomerulopathy with dense deposits on electron microscopy, (2) severe nephritic syndrome with kidney failure, low C3 levels and high C3d levels, or nephrotic syndrome with low C3 and high levels of both C3d and sC5bC9, and (3) lack of or only marginal response (during a previous disease episode) to immunosuppressive therapy (i.e., high-dose methylprednisolone, prednisolone, MMF, or plasma exchange in various schemes). Angiotensin-converting enzyme inhibitors were prescribed to all patients, in most cases combined with angiotensin II receptor blockers (ARB). Eculizumab (Soliris; Alexion Pharmaceuticals, Cheshire, CT) was given for at least 3 months and according to the dosing regimen established for atypical HUS (22). Eculizumab treatment beyond this time was at the physician’s discretion. All patients received or had previously received meningococcal vaccine and all but one had received pneumococcal vaccination before eculizumab treatment. All patients except for one were maintained on antibiotic prophylaxis until at least 2 months after cessation of eculizumab treatment. All parents (and children, if 12 years of age or older) gave informed consent for eculizumab treatment. Patient characteristics are presented in Table 1. Three patients tested positive for C3 nephritic factor, one was positive for anti–factor H antibodies, and one was found to have a homozygous deletion for CFHR1-CFHR3. Three of five patients had serologic evidence of streptococcal infection before or around the time of presentation. Results of additional testing for autoantibodies associated with autoimmune disease were negative in all patients. Two patients received eculizumab during two separate episodes. Thus, seven episodes of active nephritic and/or nephrotic syndrome due to DDD were treated with eculizumab. Clinical characteristics at time of initiation of eculizumab treatment are presented in Table 2. Four patients were prescribed eculizumab for nephritic syndrome with varying degrees of renal failure, with two patients (patients 2 and 4) requiring dialysis at time of treatment initiation. One patient (patient 5) began receiving eculizumab for recurrent nephrotic syndrome. Two patients developed a relapse after treatment discontinuation and were subsequently restarted on eculizumab. Patient 2 presented with macroscopic hematuria and nephrotic syndrome with an active membranoproliferative GN pattern plus extensive chronic damage on biopsy. Patient 4 presented with nephritic syndrome and decreased renal function. At time of the start of eculizumab treatment, all patients had nephrotic-range proteinuria (urinary protein-to-creatinine ratio ≥1.8 g/g), depressed levels of C3, and elevated serum levels of C3d. Levels of soluble terminal complement complex (sC5bC9) before treatment initiation were unavailable for two episodes, elevated in three episodes, and normal in two episodes. All patients had undergone a biopsy before treatment with eculizumab, except for patient 4 before the second episode. Median time from biopsy to first eculizumab dose was 0.4 months (range, 1 day–23 months). Light microscopy findings and scoring according to Herlitz et al. (23) are given in Table 3. Representative images plus full description of biopsy findings are provided in the Supplemental Material. Severity of biopsy findings varied between patients, ranging from severe crescentic GN affecting most glomeruli (patients 2 and 4), to mesangioproliferative GN with (patients 2 [episode 2], 3, and 5) and without (patient 1) features of chronic damage. Immunofluorescence staining was reviewed and scored as described by Herlitz et al. (23) for all biopsy specimens except for those of patient 5. In all biopsy specimens, C3c was the dominant positive stain on IF. Depositions of C3c were most prominent in the capillary wall, mesangium, Bowman capsule, and tubular basal membrane (TBM) with median (range) scores for immunofluorescence on a scale ranging from 0 to 3 of 3.0 (2.5–3), 1.5 (0–3), 2.0 (2–2.5), and 2.0 (1.5–2), respectively. Staining for C5bC9 showed a striking colocalization with C3c depositions in all biopsy specimens in capillary wall, mesangium, Bowman capsule, and TBM with scores of 2.5 (2–3), 1.0 (0.5–1.5), 2.0 (1.5–2), and 1.5 (0–2), respectively. Compared with complement staining, immunofluorescence for immunoglobulins was a less consistent finding among biopsy specimens. In three specimens it was negative and in two immunoglobulins were present in capillary wall and mesangium only, but in both cases less prominent than immunofluorescence staining for complement. Figure 1 depicts serum creatinine and urinary protein levels per patient before and during the first 3 months of eculizumab treatment. Before the start of eculizumab therapy, patients1, 2 (episode 1), and 4 had been treated with high doses of intravenous steroids and plasma exchange with no or only limited response. Patient 4 (episode 1) developed an anaphylactic reaction to plasma. After initiation of eculizumab treatment, these three patients were maintained on oral prednisone. In patient 2 (episode 1), an additional course of intravenous methylprednisolone was administered after the first dose of eculizumab, and in patient 4 (episode 1), MMF was temporarily added to eculizumab therapy. In the four other patients, eculizumab was administered while patients were either off all immunosuppressive medication (patients 2 [episode 2], 3, and 5) or receiving low-dose oral steroid therapy only (patient 4 [episode 2]). In patient 5, cyclosporine was discontinued 1 day before start of eculizumab therapy. Improvement in serum creatinine levels and urinary protein-to-creatinine ratios (UPCRs) during the first 12 weeks of eculizumab therapy. Initiation of eculizumab treatment is indicated by the vertical dotted line. Serum creatinine is indicated by closed circles, urinary protein-to-creatinine levels by open squares, plasma exchange (PLEX) treatments by vertical arrows, courses of intravenous methylprednisolone by black rectangles, eculizumab doses by capital Es, and oral prednisone dosage (mg/kg per day) as shaded rectangles. ACEi, angiotensin-converting enzyme inhibitor; ARB, angiotensin-receptor blocker; MMF, mycophenolate mofetil; CyA, cyclosporine. In all patients proteinuria decreased; median urinary protein-to-creatinine ratio decreased significantly (8.5 [range, 2.2–17] versus 1.1 [0.2–2.0] g/g; P<0.005) during the course of 12 weeks. In addition, on a group level, renal function improved with a median decrease in serum creatinine of 36% (range, 12%–74%) over the course of 12 weeks (eGFR at treatment initiation, 58 [17–114] versus 77 [50–129] ml/min per 1.73 m2; P<0.01). 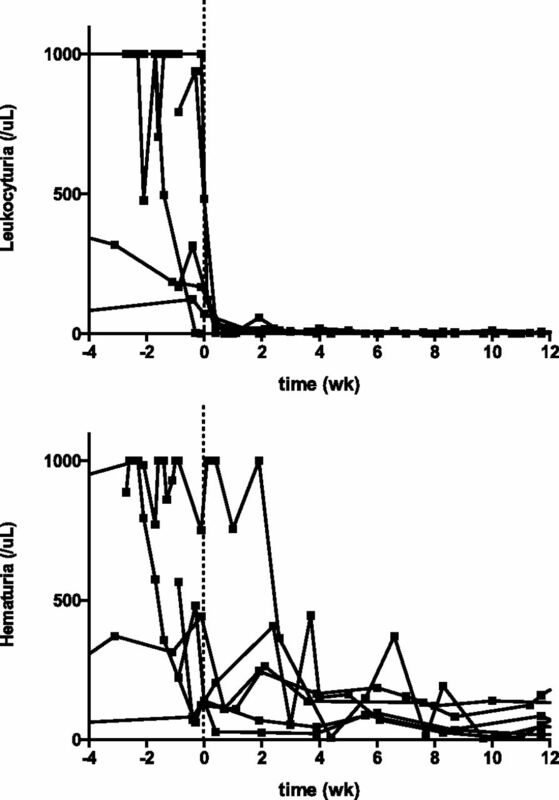 Figure 2 depicts leukocyturia and hematuria before and after eculizumab treatment. Urinary cell counts were unavailable for patient 5. In all other episodes, patients presented with significant leukocyturia (>100/μl). In patient 1, leukocyturia had receded before eculizumab initiation. In the other episodes, patients rapidly responded to eculizumab, with leukocyturia disappearing almost completely within 1 week. Hematuria also receded after eculizumab treatment initiation, but only after 1–2 months. Fast and almost complete resolution of leukocyturia (upper panel) compared with delayed and partial response in hematuria (lower panel) following initiation of eculizumab therapy. Squares represent urinary counts (expressed as cells/μl) of leukocytes or erythrocytes with lines interconnecting individual subject's values. Initiation of eculizumab treatment is indicated by the vertical dotted line. Median follow-up since each individual’s first dose of eculizumab was 18.1 months (range, 12–29.2 months). Overall, eculizumab therapy was well tolerated and no adverse events, including no infections, were noted. In three patients, eculizumab was discontinued after median treatment duration of 5.8 months. In two of these patients (patients 2 and 4), disease relapsed, respectively, 18 and 5 months after discontinuation of eculizumab therapy; they resumed eculizumab therapy. In patient 1, a repeat biopsy specimen was obtained 3 months after initiation of eculizumab because kidney function had improved but not returned to normal. On biopsy, histologic features were unchanged with persistent mesangiocapillary GN and active tubulointerstitial nephritis. These findings prompted the addition of plasma infusions to the oral steroids and eculizumab given at the time, but kidney function did not improve. Seven months after the first dose of eculizumab, both eculizumab and plasma therapies were discontinued. Apart from a short episode of nephrotic proteinuria, most probably due to nonadherence to angiotensin-converting enzyme inhibitors, the patient has remained in a stable condition with an eGFR of approximately 70 ml/min per 1.73 m2 in the 2 years since. This patient remains off eculizumab until this day. The other four patients continue on regular doses of eculizumab. Table 4 gives a summary of clinical condition at last follow-up. Serum creatinine levels were similar to levels at 12 weeks of treatment initiation or reinitiation with a median change of −2.2% (range, −14% to 8%). Kidney function has not returned to normal in all cases. Levels of proteinuria had decreased further, reaching non-nephrotic levels in all. Plasma levels of C3 remain depressed in all patients (data not shown). We found a significant and impressive response to eculizumab in a total of seven treatment episodes in five pediatric patients with DDD. Both kidney function and levels of proteinuria improved significantly during the first 12 weeks of eculizumab treatment. Dialysis could be discontinued in two patients. In addition, we found in five of six treatment episodes with available data, that response to eculizumab was heralded by the disappearance of leukocyturia. Eculizumab therapy was well tolerated by all patients. The use of eculizumab for DDD was previously reported in 11 patients (13–21). Our case series adds a substantial number of patients to the current body of literature. It is the first series of pediatric patients and this is important in view of the average age of patients with DDD. Although our series did not contain any transplant recipients, several received extensive immunosuppressive treatment before eculizumab (three of seven treatment episodes). In a further three episodes oral immunosuppressive drugs were discontinued immediately before the first dose, temporarily added to eculizumab therapy, or continued for several months. Consequently, a contribution of these therapies to the clinical response cannot be ruled out. This being said, it should be noted that eculizumab was prescribed only when response to immunosuppressive therapy was deemed insufficient. In addition, in three episodes eculizumab was administered while patients were off all immunosuppressive medication. In one, the patient was receiving low-dose oral prednisone only. The clinical improvement following the first dose of eculizumab was almost immediate in all patients, regardless of additional immunosuppressive medications prescribed. We therefore consider it unlikely that the previous or additional treatments alone accounted for the observed improvement. After the initial response to eculizumab, clinical conditions improved further or remained stable. Improvement was such that in two of the most severely affected patients, eculizumab was discontinued completely. Both patients subsequently developed a relapse, only to respond to eculizumab in a similar manner as before. In one patient, persistent yet moderate chronic renal impairment and non–nephrotic-range proteinuria prompted a kidney biopsy and finally discontinuation of eculizumab therapy. In this patient the response to eculizumab can at worst be considered partial. At last follow-up, 1 year or more since each individual’s first eculizumab dose, all patients remain off RRT and only one patient has CKD stage III (24). Moreover, nephrotic-range proteinuria resolved, in part because of antiproteinuric therapy. Our findings are in line with previous publications on eculizumab in C3 glomerulopathy reporting beneficial effects in most but not all patients. Our data, however, do not support the observation that effectiveness of eculizumab in C3 glomerulopathy is related to pretreatment levels of sC5bC9 (14), at least not in pediatric patients with DDD. Until now, the outcome of five patients with DDD with available pretreatment levels of sC5bC9 has been reported (13–16). When combined with our data, outcome in the seven patients with elevated sC5bC9 levels was positive in four patients (patients 5 and 2 [episode 2] and patients described by Bomback  and Daina  et al. ), partial in two patients (patient 1 and a patient described by Gurkan et al. ), and absent in one patient (described by Bomback et al. ). This is similar to the outcome in patients with normal sC5bC9 levels: positive in two patients (patients 3 and 4 [episode 1]) and negative in one (14). One explanation for the lack of correlation between treatment response and levels of sC5bC9 may be that sC5bC9 does not reflect the disease process in the kidney. This is underscored by the finding that in all our patients immunofluorescence staining on pretreatment biopsy specimens was strongly positive for C3c and C5bC9, despite varying levels of sC5bC9. A second and more mundane explanation might be the adequacy of sC5bC9 measurements because reliability depends on sample handling and experience in the laboratory. Another explanation might be that eculizumab does not block the uncontrolled activation of the alternative pathway underlying C3 glomerulopathy as a whole. Eculizumab inhibits the cleavage of C5 into proinflammatory and prothrombotic C5a and C5b. The pathogenic involvement of the late phase of the complement cascade in C3 glomerulopathy was made apparent in animal experiments, where C5 gene deletion or antimurine C5 antibodies ameliorated kidney disease in CFH-deficient mice with disease similar to DDD (25). In this model, however, proteinuria did not resolve because of the persistent formation of C3 split products (25). The determinant role of activated C3 fragments in DDD in CFH-deficient mice was further tested in CFH−CFI− mice (26). In contrast to CFH-deficient mice, these mice, lacking both CFH and CFI, did not present with DDD. Because CFI is involved in further splitting C3b into iC3b, C3c, C3dg, and C3d, these data clearly show the determinant role of C3b split products in experimental DDD pathophysiology. Eculizumab prevents inflammation secondary the glomerular deposition of C5a and C5bC9 (27) but does not interfere with the formation of C3 split products and their glomerular deposition. This partial effect of eculizumab may bode ill for patients in the long run. Indeed, we observed signs of ongoing activation of the alternative pathway despite eculizumab treatment: in all patients, plasma C3 levels remained depressed with concurrent elevated levels of C3d, indicative of persistent C3 breakdown. It seems reasonable to assume that the ongoing production of C3 degradation products may lead to chronic inflammatory changes and, in the long run, to renal injury. To our knowledge, the effect of eculizumab on leukocyturia in DDD GN has previously not been described. Although leukocyturia is not commonly reported as a presenting symptom in DDD (8,9,28), it was a consistent finding in all patients with urinary leukocyte counts available. In the absence of other causes of leukocyturia, the fact that leukocyturia disappeared almost completely and within 1 week after the first dose in all episodes of GN with leukocyturia strongly indicates a direct effect of eculizumab. In all episodes with leukocyturia with pretreatment biopsy specimens available for review, we found the TBM to be positive for C5bC9 on immunofluorescence, whereas staining for C5bC9 was negative in the one patient (case 1) in whom leukocyturia had disappeared before the first eculizumab dose. This finding suggests the involvement of the tubulointerstitial apparatus in the disease process, although we did not find a correlation between leukocyturia and the degree of tubulointerstitial inflammation on biopsy. We postulate that leukocyturia might reflect involvement of the tubulointerstitial apparatus and might be suitable as an indicator of disease activity and reaction to therapy. Our report has various limitations. The most important ones are its retrospective character, the limited number of patients, and the lack of standardization in treatment regimen and follow-up. A justification for the course of events lies in the lack of experience with eculizumab in DDD at a time when we were confronted with a series of patients who have this rare disease. The acute character of the patients’ clinical condition impeded setting up a trial of eculizumab. Minor limitations might be that no pharmacokinetic studies were performed and few repeated measurement of sC5bC9 were obtained. In conclusion, in this case series of pediatric DDD, we found evidence of a beneficial effect of eculizumab. Response to eculizumab was heralded by the disappearance of leukocyturia yet was unrelated to plasma levels of sC5bC9. As no other therapeutic options are available to date, we think that these and previous observations warrant a randomized controlled trial of eculizumab. For this purpose, the addition of eculizumab to standard treatment should be compared with standard treatment alone in a randomized and blinded fashion in patients presenting with acute DDD GN and compared with placebo treatment in patients with chronic DDD on maintenance therapy. Primary outcome parameters should be renal function and proteinuria. Repeated renal biopsies, complement parameters including sC5bC9 levels and urinary leukocyte count should be considered as secondary outcome parameters. Finally, pharmacologic studies of eculizumab should be a part of both studies. In our opinion, for such a study to succeed, international cooperation is essential. For four patients, Alexion Pharmaceuticals provided eculizumab free of charge. J.W.G. reports receiving unconditional research funding from Alexion Pharmaceuticals, B.H, reports being member of a pediatric advisory board of Alexion Pharmaceuticals, and J.C.D. is member of the Belgian expert group on atypical HUS, which receives funding from Alexion Pharmaceuticals. Alexion Pharmaceuticals was in no way involved in the drafting or editing of the manuscript, or the decision to submit it for publication. Abstracts describing part of this case series were presented at the following conferences: Dutch Complement Symposium 2014, March 21, 2014, Nunspeet, The Netherlands, and 47th annual scientific meeting of the European Society for Pediatric Nephrology (ESPN), September 18–20, 2014, Porto, Portugal. This article contains supplemental material online at http://cjasn.asnjournals.org/lookup/suppl/doi:10.2215/CJN.01360215/-/DCSupplemental.